(FinalCall.com) - Media turned out for a major press conference at Toussaint L’Ouverture Airport in Port-au-Prince when the Honorable Minister Louis Farrakhan arrived in Haiti, the western hemisphere’s first Black republic. The Minister’s arrival Dec. 11 sparked a flurry of activity and meetings, which included the press conference and a reception that evening attended by some of Haiti’s national lawmakers, said Abdul Akbar Muhammad, international representative of the Nation of Islam. During the reception, Min. Farrakhan walked through Haiti’s history and independence heroes in a masterful way, said Mr. Akbar Muhammad. Min. Farrakhan shared how Voodoo was important to the country’s coming to birth and though Haitians may be Christians and Muslims, leaders of the spiritual movements need to come together for the good of the country, he continued. The Minister was scheduled to be in Haiti for five days and is looking at how the Nation can help Haiti rebuild almost two years after a major earthquake. “I have longed throughout my life to set my foot in the sacred soil of Haiti,” Min. Farrakhan said, at the airport press conference. Haitian Foreign Minister Laurent Lamor welcomed the Minister at the airport. President Michel Martelly is scheduled to meet with Min. Farrakhan during the visit. Haitians welcomed the Minister is a wonderful way, said Mr. Akbar Muhammad. The Haitian government has provided security and transportation within the country, he added. Prior to his visit, the Minister and the Nation of Islam donated a $150,000 water purification system to Haiti in August, on the 200th anniversary of the gathering that led to the Haitian Revolution. 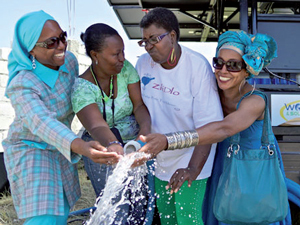 The 30,000 gallon-a-day system, which is solar powered, was installed in partnership with activist Ezili Danto and her Haitian Lawyers Leadership Network. The installation included a weeklong training on the system and a delegation of Nation of Islam Muslims primarily of Haitian descent. The water will be distributed to different communities in Port-au-Prince. Cholera, a waterborne disease, has killed hundreds and injured thousands in Haiti, and the system was part of an effort by Min. Farrakhan to directly help the poorest and most vulnerable Haitians. Cholera is widely believed to have been introduced by unsanitary practices of a contingent of UN peacekeepers. 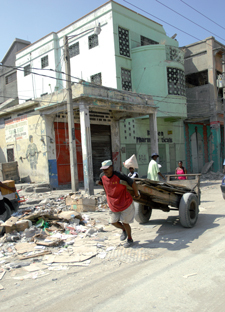 Since the devastating earthquake in 2010, Haitians have struggled to rebuild their country. 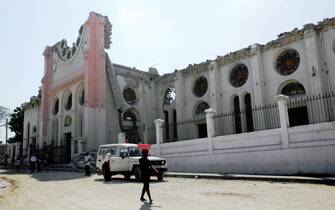 Shortly after the deadly earthquake, Min. Farrakhan rallied the members of the Nation of Islam to support their suffering brothers and sisters in Haiti and met with Haitian-American leaders and groups to support their efforts and chart the best course for helping the country. “Even the homeless under bridges may be in a better condition in America than the hundreds of thousands that are now homeless, broken, busted and in need of medicine, in need of doctors in Haiti,” said Min. Farrakhan shortly after the tragedy struck and in calling for a united Black front to help Haiti. “God gave us Haiti to look at and we should study what is missing that could save lives and then start our preparedness for the same thing unfortunately that happened in Haiti will soon come to America and her cities,” he said.